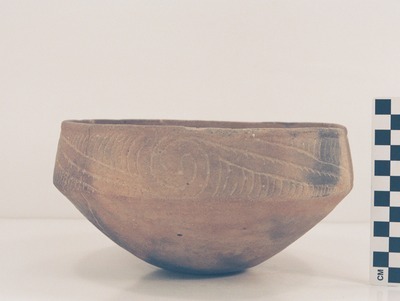 "41MR12, Burial I, 51" by Timothy K. Perttula and Robert Z. Selden Jr.
DECORATION: Engraved interlocking scrolls repeated four times on the vessel rim. There are zones filled with 20 curvilinear lines both above and below the scroll element, and the central scroll line has a series of small triangular tick marks on it. Taylor Engraved vessel MR12-51 from Burial I at the Ben McKinney site.